Have the traditions been distorted? Note that the former site on the helix, of which I now understand the efficacy, would never have allowed me to discover auriculotherapy. Fig. 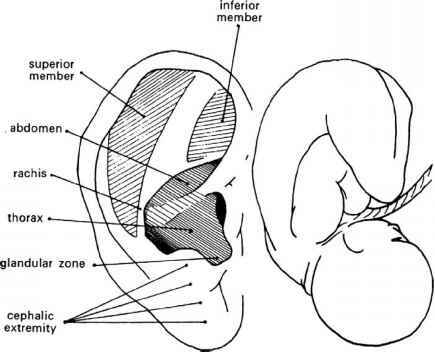 1.7 The auricle and fetal image according to Paul Nogier (reproduced with permission). In February 1956 Nogier was invited by Dr Niboyet, a leading authority in acupuncture, to hold his first conference at the First Symposium of the Societe Mediterraneenne d'Acupuncture in Marseille. In September of the same year he was invited by Dr Gerhard Bachmann (1895-1967), president of the German Association of Acupuncture, to give a similar speech in Wiesbaden. A few months later a report of his 6 years of research was published in three different issues of the journal Deutsche Zeitschrift für Akupunktur (DZA).10 The first detailed maps of the ear were officially born and Dr Bachmann himself made the drawings, as he was a skilled artist, having graduated in architecture before graduating in medicine (Figs 1.8, 1.9). As DZA was regularly read by Russian, Japanese and Chinese physicians among others, the article and its maps rapidly spread all over the world. 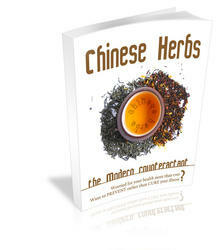 China was the first country to translate the article and validate the new diagnostic and therapeutic method. Just 1 year later, in the December 1958 issue of the Shanghai Journal of Chinese Pharmaceutics and Medicine, Yeh Hsiao-Lin published a summary of Nogier's three articles entitled 'Introduction to ear acupuncture therapy'. It has to be remembered that every new discovery in the field of medicine is greeted not only with admiration but also with criticism, and sometimes with envy. The same thing happened to auriculotherapy, which was welcomed with enthusiasm by an increasing number of physicians but also had to face the comments of some incredulous colleagues. Fig. 1.8 Paul Nogier's 'historical' map drawn by Gerhard Bachmann (reproduced with permission of Dietrich Bachmann and DZA). remembered everywhere in the world but, unfortunately for the author of this controversy, only few physicians remember the name of Dr De la Fuye! 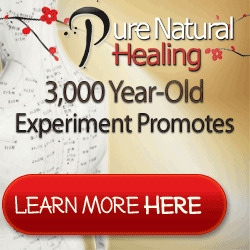 Since the late 1950s, government institutions of the People's Republic of China have been in charge of restoring the reputation and promoting the practice of Chinese medicine. According to Hsu,12 three 'innovations in acumoxa' (zhenjiu) were promulgated by the government during the Maoist periods of the Great Leap Forward (1958-61) and the Cultural Revolution (1966-76): analgesia (zhenjiu mazui), scalp acupuncture (touzhen) and ear acupuncture (erzhen). The first, analgesia, became popular nationally and gained international recognition after delegations sent to China in the late 1960s and early 1970s visited hospitals in the big cities. They reported some impressive photographic documentation of surgical interventions performed with acupuncture analge-sia.13 The technique was applied during head, chest and abdominal surgery, stimulating acupuncture points on the body and on the auricle both manually and electrically. This application of acupuncture lost its popularity in the 1980s, both in China and in Europe, largely because the technique was time-consuming to apply and because the level of induced hypoalgesia was insufficiently predictable in different subjects and different types of intervention. 475 BC to AD 23). Chapter 28 reports: 'The ear is the place where all the channels meet', and Chapter 29 advises: 'By inspecting the condition of the ear, one knows whether the individual has an illness or not'. Several techniques for treating disease were described in ancient times either as folk remedies or as specific treatments proposed by individual physicians. Among them are reported: the tradition of smearing, filling or blowing drugs into the ear; moxibustion of the apex for cataracts or acute conjunctivitis; massage of the helix to prevent deafness; needling of the helix, once more, to treat parotitis or to expel Wind for relieving backache, etc. According to Huang,14 auricular therapy was long supposed to have the function of regulating the deficiency of qi, strengthening the senses, invigorating the function of Liver blood, nourishing Yin and regulating the function of the Kidney. Despite this consideration for the ear there is no mention in ancient Chinese literature of a somato-topic arrangement of the auricle as proposed by Nogier. The only exception is probably the posterior or medial surface of the ear which was described in detail, mainly for diagnostic purposes, by Zhang Di-Shan of the Qing dynasty in 1888. His book 'Essential Techniques for Massage' contained what is perhaps the first Chinese auricular map to be drawn. The illustration reports five regions corresponding to the five zang organs (Heart, Kidney, Spleen, Liver and Lung) (Fig. 1.10A). 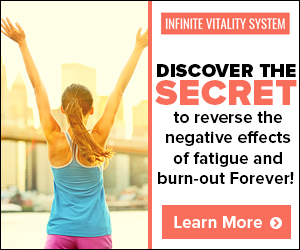 This view has some analogies to the disposition of the five elements but also to the threefold division of the body into Upper, Middle and Lower Burner according to traditional Chinese medicine (TCM). Even the tongue, among the various systems which describe the correspondences between specific areas and individual organs, could present some analogy with Zhang's chart.15 The document has been accepted as part of the historical heritage by all contemporary Chinese authors and included officially in the process of the standardization of nomenclature completed in 1993 (Fig. 1.10B). 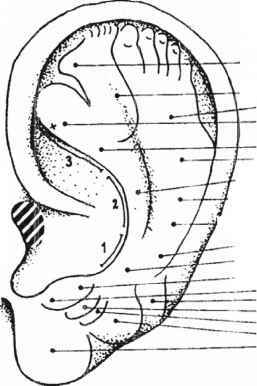 In the story of the development of ear acupuncture we should also mention Dr Xu Zuo-Lin of Beijing who in 1959 performed what was probably the first clinical validation on 255 patients for the most different diseases.14 Using Nogier's maps, Xu introduced a series of new points which were linked to TCM. One of them was shen (the point of vitality) which became universally popular among acupuncturists as Shen men and is included in several Western maps (Fig. 1.11).